If you've heard about Hello Kitty Con, then you must have heard about China's Hello Kitty Go Around carnival event. "They are made from Polyurethane or PU and will break if it falls ! Only 200 each design were made exclusively for hello kitty go around event , it is NOT numbered"
In every collection, you will find that there are special collectibles that you know -- and, I emphasize -- you *know* what makes your collection stand out. These two figurines are those special treasures that you can't resist from clutching in sheer joy. With heavy breathing from excitement, my trembling hands cut away the strips of many tape surrounding the package. It was like a slasher movie. My excitement over finally getting my hands on these babies were driving me crazy because the box seemed difficult to open. You definitely get your money's worth because HelloKittyTreasure packed it very securely. Thank you, Mai! Even with a sharp weapon in my hands (TIP: everyone who is a relative/friend of a Sanrio collector, avoid us when we're opening a Sanrio package), I gave up trying to be reasonable with the box. My patience had run out. With so much energy coming out of nowhere, I teared into that tightly wrapped package. I was panting by the time I had ripped open the box. My brother came into the room and found me on my knees clutching the two figurines in each arm. I had been spazzing out of sheer joy for the last minute or two. Prior to that, I had been dancing the geeky-joyful-dance. Don't ask. It's embarrassing enough to admit it on this blog. These two figurines are now stacked on top of piles of messy Sanrio stuff on my desk. They're all waiting for me to get to them and pack them away in my temporary Sanrio storage room. 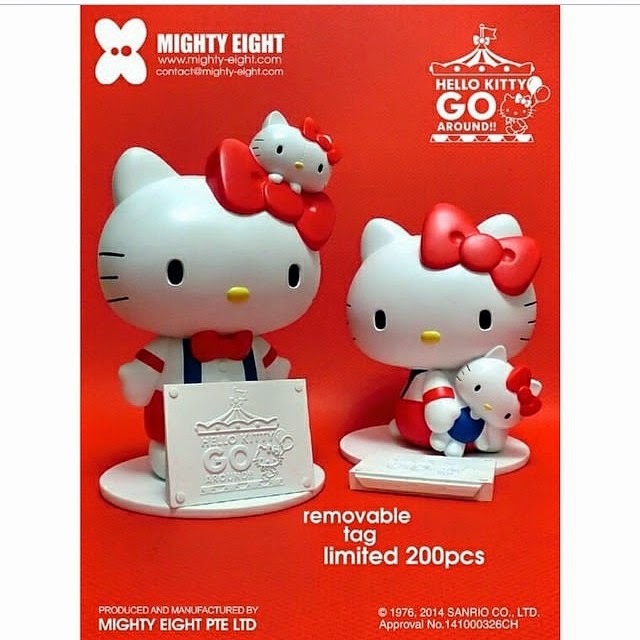 Plugin: If you want one of your own, contact HelloKittyTreasure on her Instagram. While supplies last. DM for the price.